The grates we have chosen to offer to our customers are of a very heavy green cast iron construction which means that the grate has to be seasoned with three seasoning fires. Upon completion the grate will triple in strength. We have written up an instruction sheet that we include with purchase that will guide you through the process. The risk of not following the instructions could mean cracking or damaging the grate so we of course do highly recommend following our guide. Once seasoned the grate should last you many years of safe and efficient fire burning. - This allows for logs to roll to the back of the fireplace keeping the proper flow of air (the S pattern) and makes it very difficult for logs to roll out of the fireplace. - Allows for a complete burn of the logs, resulting in hot coals and embers, and no smoldering or half burnt logs. 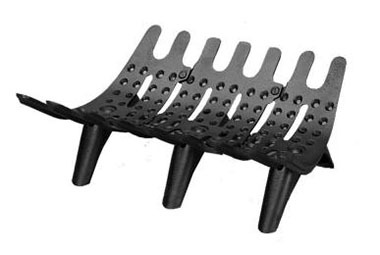 - Due to a thick design, it is very hard to burn these grates out if you stay on top of clearing ashes under the grate and the additional benefit is that the added mass means you'll have more radiant heat from the metal itself. 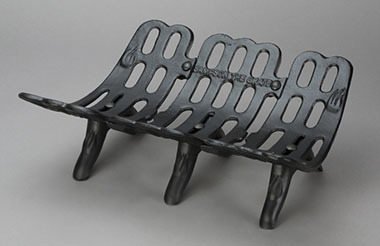 We offer two styles of grates from Pre-Fab size up to walk-in fireplace size we can find a grate that suits your needs. To purchase any of these grates please feel free to contact us and we will guide you through the process of finding out what size is needed. Of course if we are on site we try to always stock a handful of grates so be sure to ask during your next inspection or cleaning.